Kid Rock is not stranger to the Motor City. As the self-appointed goodwill ambassador for Detroit, Michigan, Kid Rock celebrated his 40th birthday with a HUGE concert at Ford Field in Detroit on Saturday, September 15th. This show was so big, they moved the Monster Jam event, originally scheduled for that night, to the weekend prior. This show was not unlike previous appearances with high profile guests like Sheryl Crow, Uncle Kracker, J. Giels front man Peter Wolf, Rev Run (Run DMC) and others. 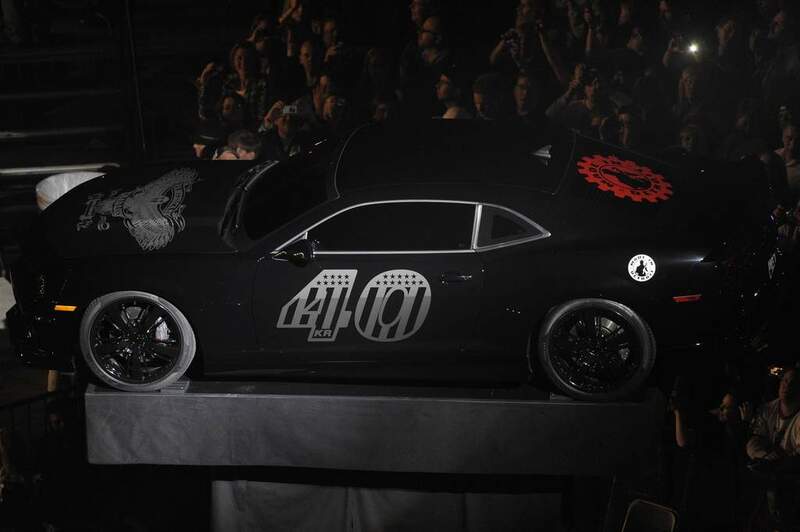 This blowout event showcased one of his presents, a 2011 Chevrolet Camaro SS customized with a Made in Detroit theme. This custom, blacked out Camaro features the Made In Detroit logo on the rear deck lid and fuel filler door, black custom wheels and a replica of the American Badass tattoo that spans across Kid Rocks back. Reports state this was a gift from Chevrolet, and others say it came from NASCAR driver Jimmie Johnson. We were not able to confirm the source, but I'm sure we will hear more details about this cool Camaro very soon. Stay tuned!